When trying to stick to a psoriasis friendly diet that consists of zero nightshade vegetables it can be tough to find suitable replacements for potatoes. Cauliflower is a great substitute to give you that carb type feeling associated with white potatoes. The final outcome of this recipe is a mash that has lots of flavour and you will never want normal potatoes again after this. Please be warned there is unsalted butter in this recipe so you can replace with some extra virgin olive oil or ghee if required. You will find that this once avoided vegetable will now become one of your staple food items from now on! Place cauliflower in a steamer basket in a large soup pot, season with salt and pepper, and steam until soft (about 10–12 minutes, test with a fork). Heat 1 tablespoon of pasture butter in a nonstick frying pan over medium heat. Sauté onion, garlic, and herbs until onion is translucent. 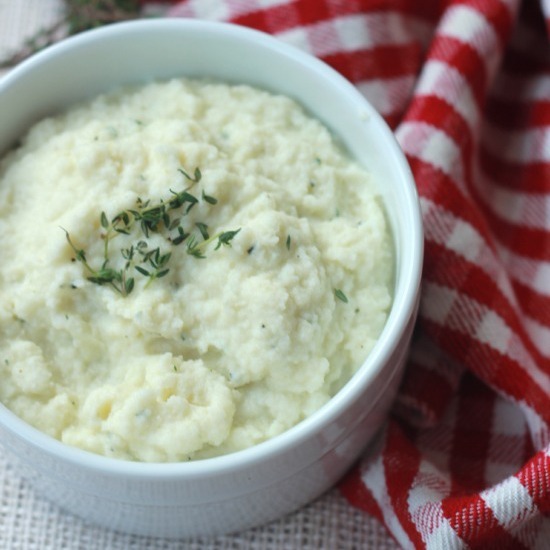 Place steamed cauliflower into a high-speed blender or food processor. Add the sautéed onion, garlic, and herbs, along with the second tablespoon of butter. Garnish with a sprig of rosemary, or a sprinkling of fresh ground pepper. This recipe is a tab bit more difficult to prepare compared to other recipes I have included but you will love the outcome. Thanks to primalpalate.com for the recipe idea and bakerbettie for the image.